Top quality PVCu windows, A-rated double and triple glazing, french doors, patio doors, composite and PVCu doors. 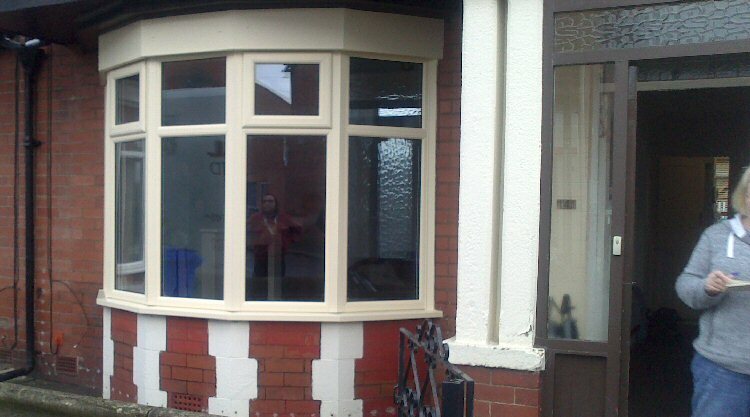 Tony and Lindsey of Blyth wanted something different when they installed double glazing. They decided they wanted cream on the outside and white on the inside. They asked various companies to quote but nobody came back to them. They were recommended to Dave Kendall through a relative who manages Dave's website. Dave explained not many companies were able to install different coloured windows but he knew one of his suppliers down the country would be able to supply him. He quoted, got the contract and installed the A-Rated bay window. Tony and Lindsey are over the moon with the finished job and they have now had their porch replaced by Dave Kendall.